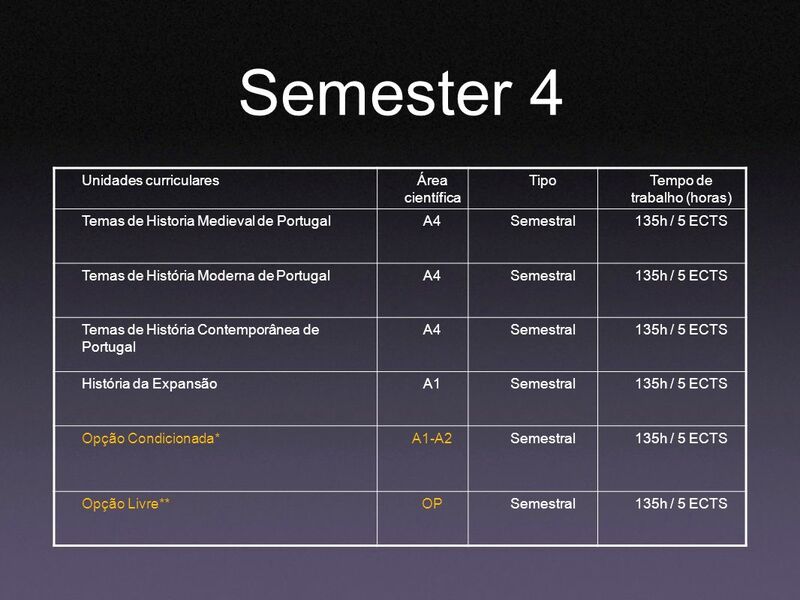 Designing the History Curriculum at Coimbra. Summary From principles to strategies: how to get it started and making it work. Incorporating the Tuning. 2 Summary From principles to strategies: how to get it started and making it work. 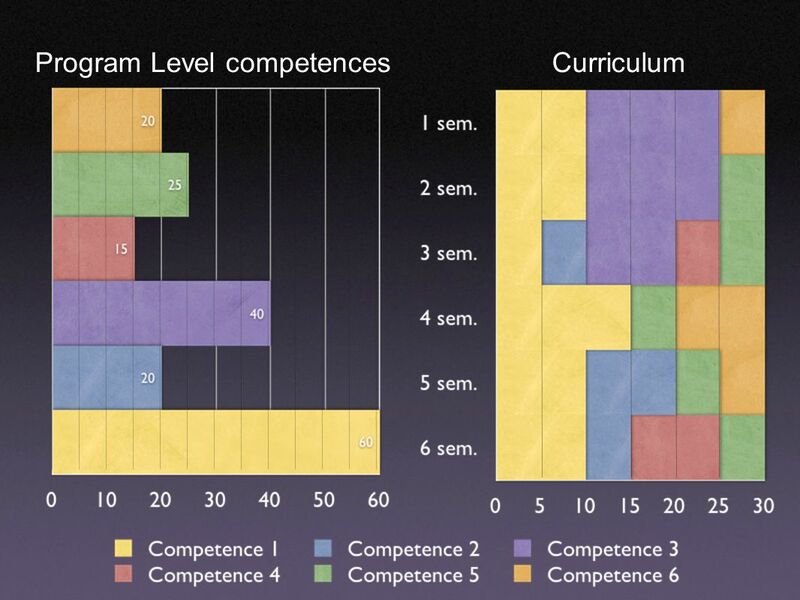 Incorporating the Tuning approach: strategies for designing a competence based curriculum. Quality Assurance new style: local QA strategies in the Bologna era. 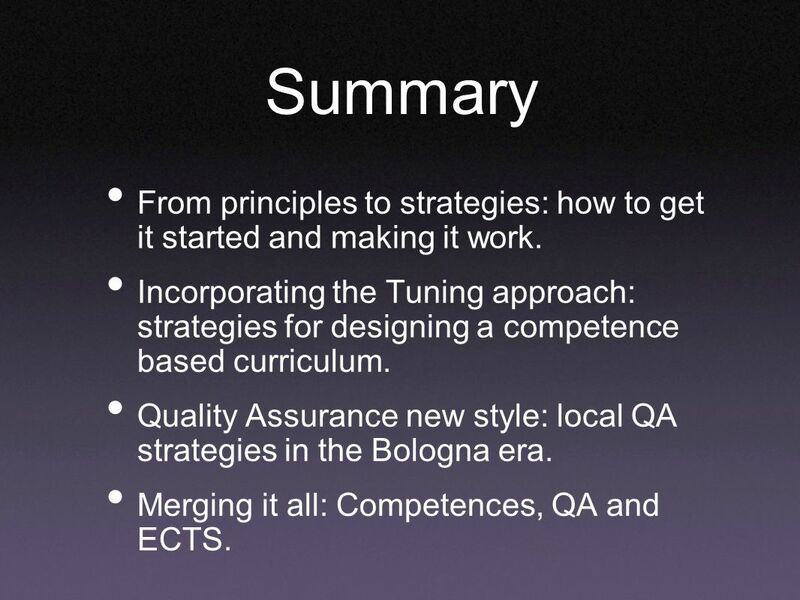 Merging it all: Competences, QA and ECTS. 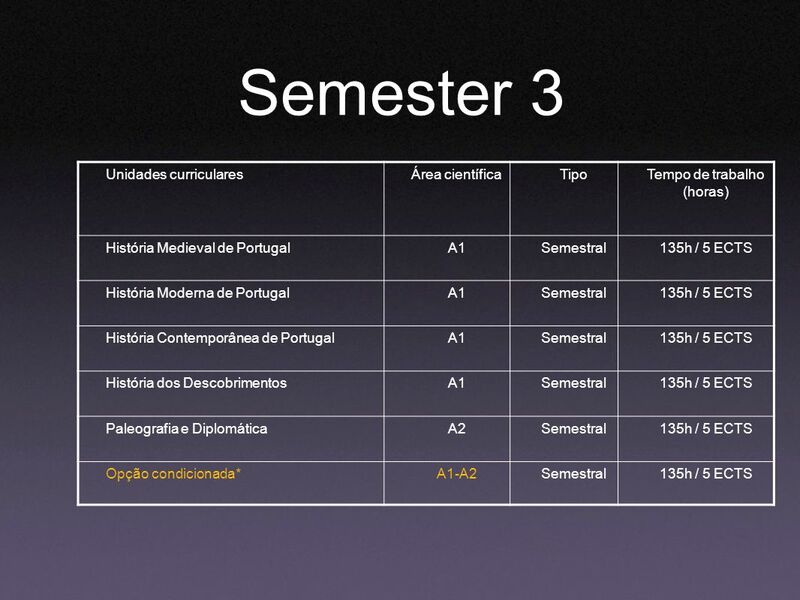 3 Background 2001: Autonomous global reform of curricula at Faculty of Humanities in Coimbra parallel to participation in Tuning I, History Area, CLIOHnet network. 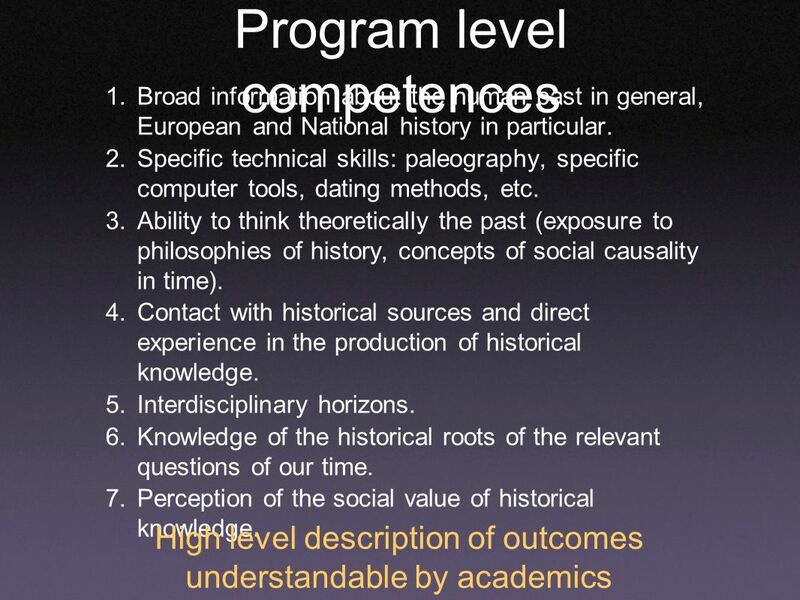 2002: New History program, competence based, submitted to Ministry for approval. 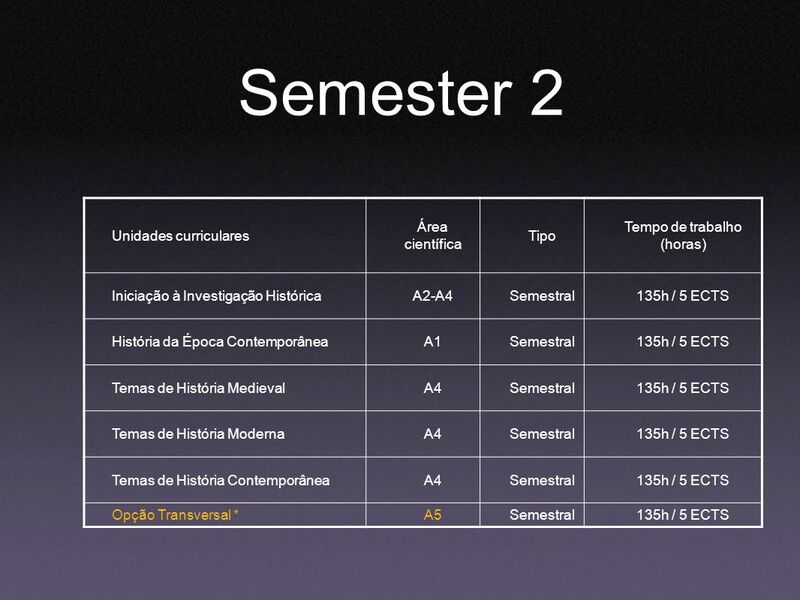 2002: History at Coimbra is evaluated in ENQAs Transnational European Evaluation Project (TEEP). 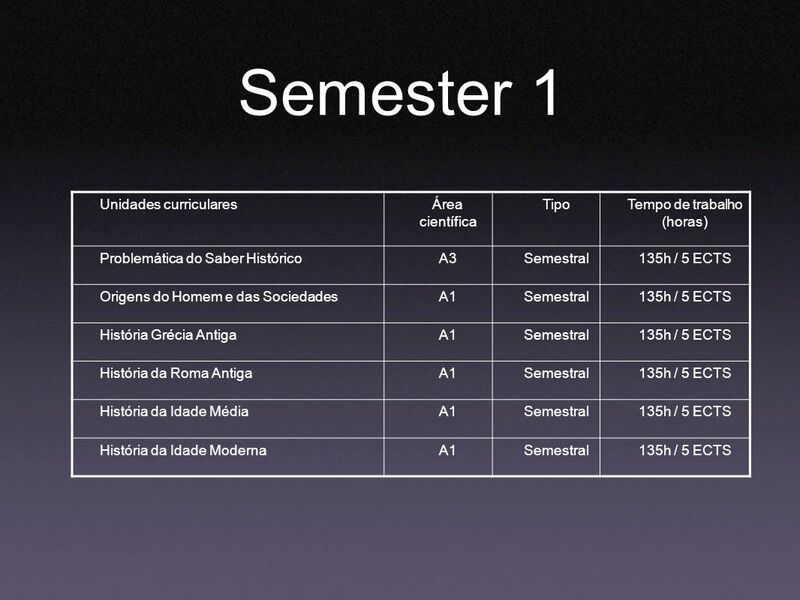 Results disseminated at University level. 2003: New programme starts. Previous reform: 1986. 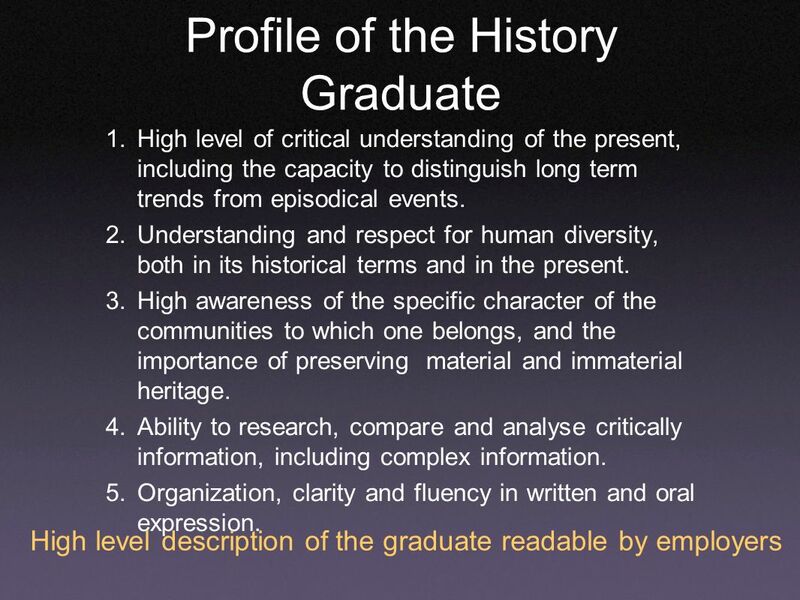 2004: National level discussion produces Tuning inspired level descriptors, profiles and competences for History degrees, adopted as reference by Ministry. 2005: CLIOHnet2 begins 2006: New Ministry, new forced reform. Degree shortened to 3 years. Adjustments made. Starting 2007. 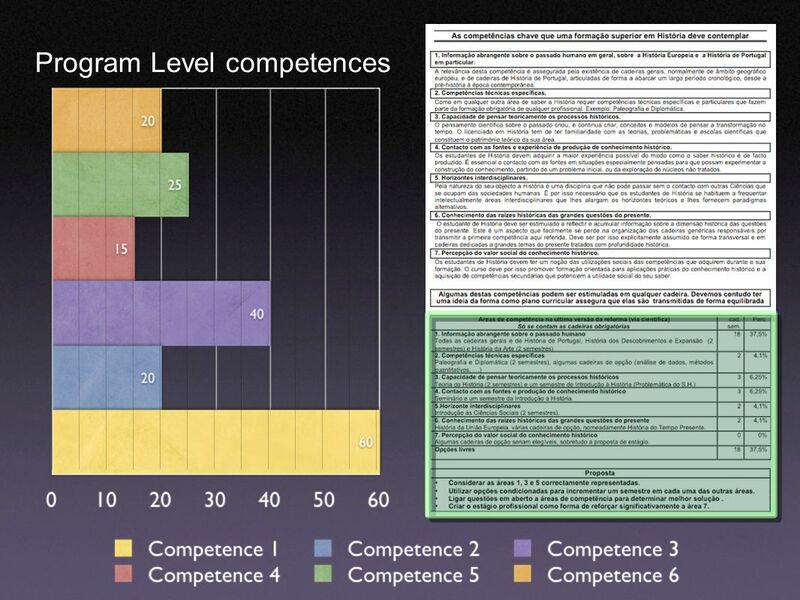 7 The profile and program level competencies keep curricular reform focussed. Keeping it simple at this step was important to gain support and achieve consensus. 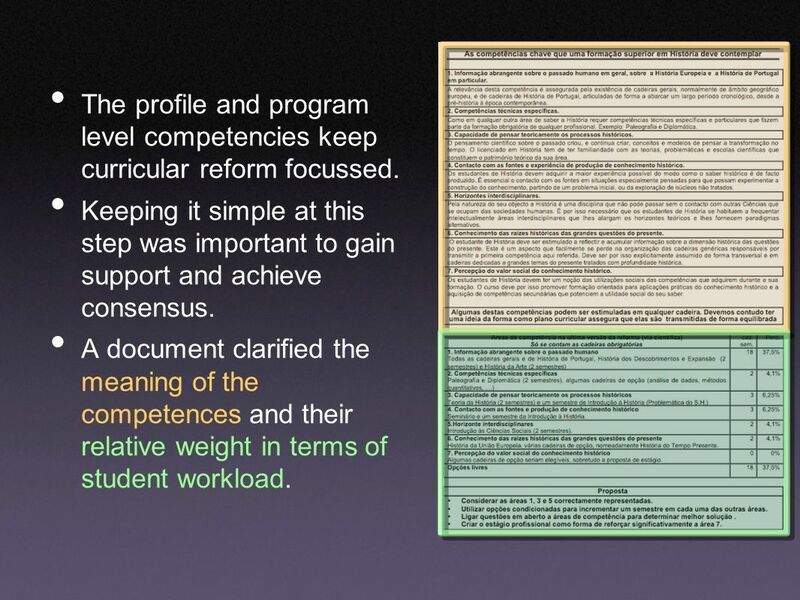 A document clarified the meaning of the competences and their relative weight in terms of student workload. 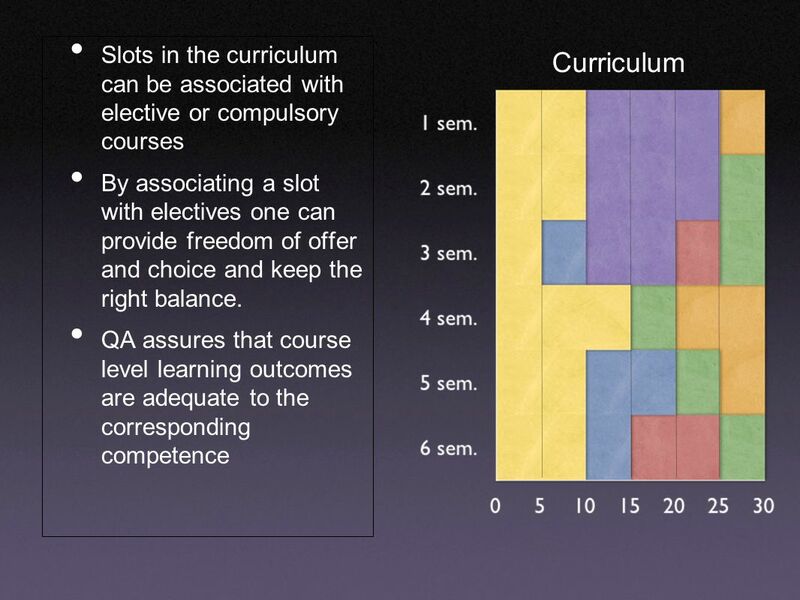 8 Mapping competences to courses Mapping is way to match course level learning outcomes to program level learning outcomes and competences. 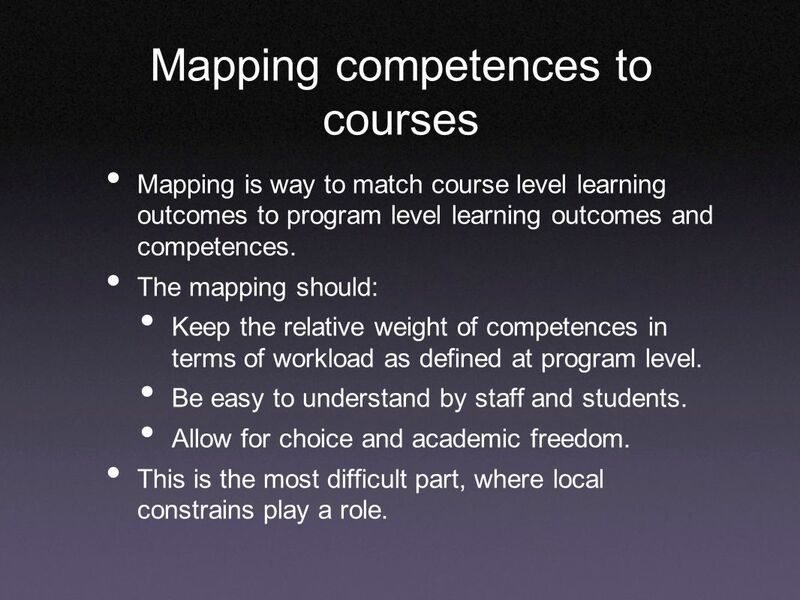 The mapping should: Keep the relative weight of competences in terms of workload as defined at program level. Be easy to understand by staff and students. Allow for choice and academic freedom. This is the most difficult part, where local constrains play a role. 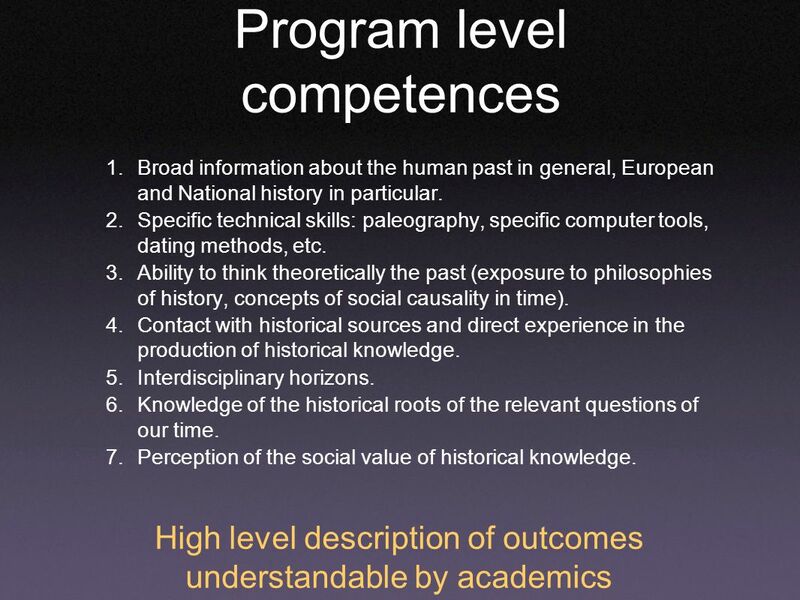 9 How to map One to Many: one competency, many courses: each global competence is promoted in several courses but each course contributes mainly to a single global competence. 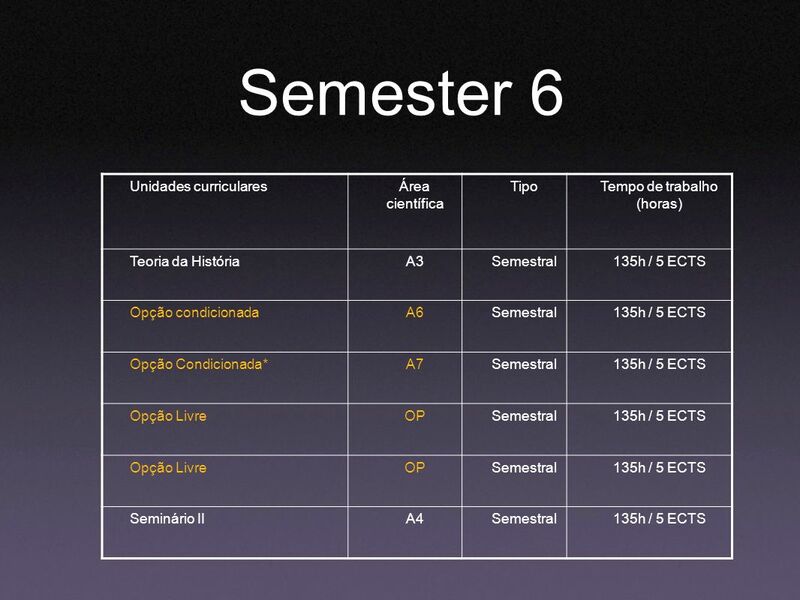 The workload associated with a global competence is the sum of the ECTS of the associated courses. Easy to setup, negotiate and monitor. 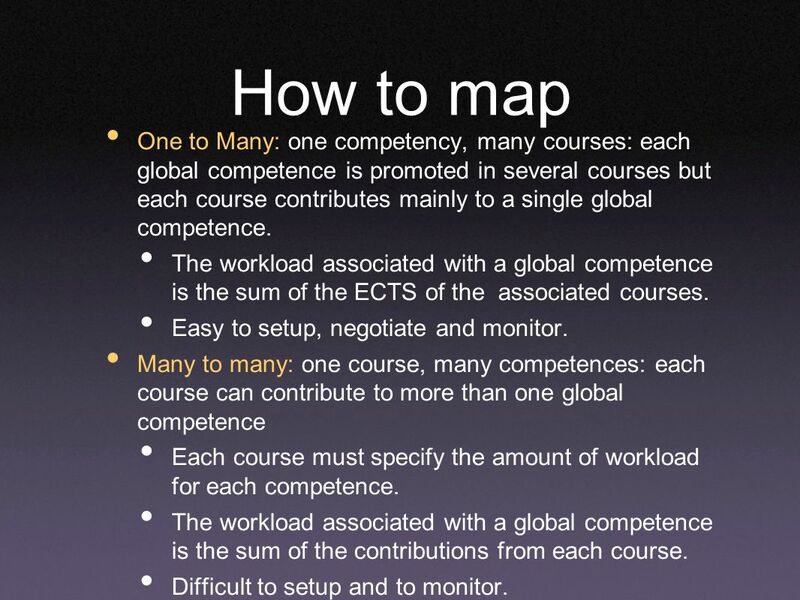 Many to many: one course, many competences: each course can contribute to more than one global competence Each course must specify the amount of workload for each competence. 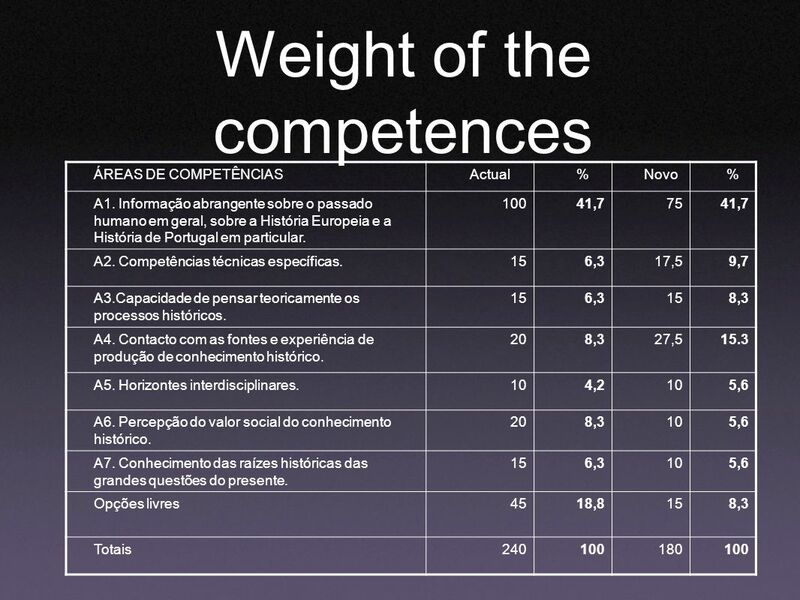 The workload associated with a global competence is the sum of the contributions from each course. Difficult to setup and to monitor. 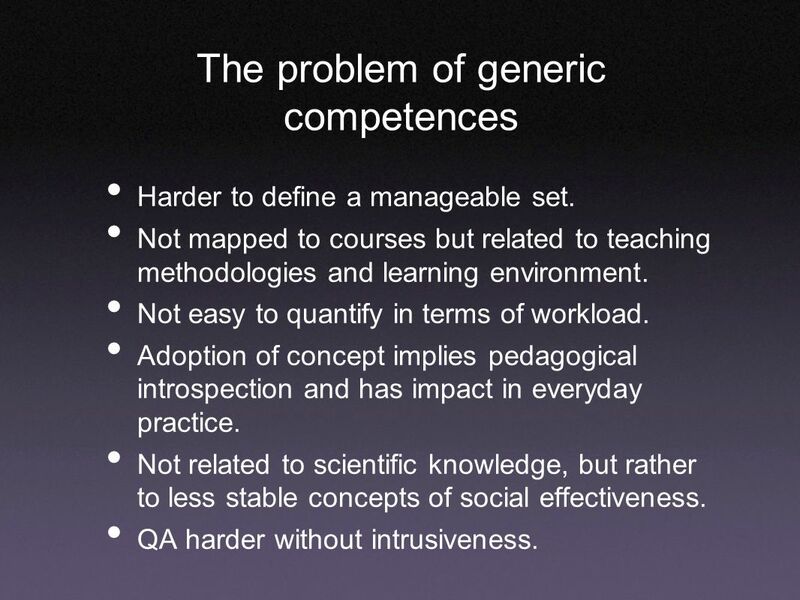 13 The problem of generic competences Harder to define a manageable set. 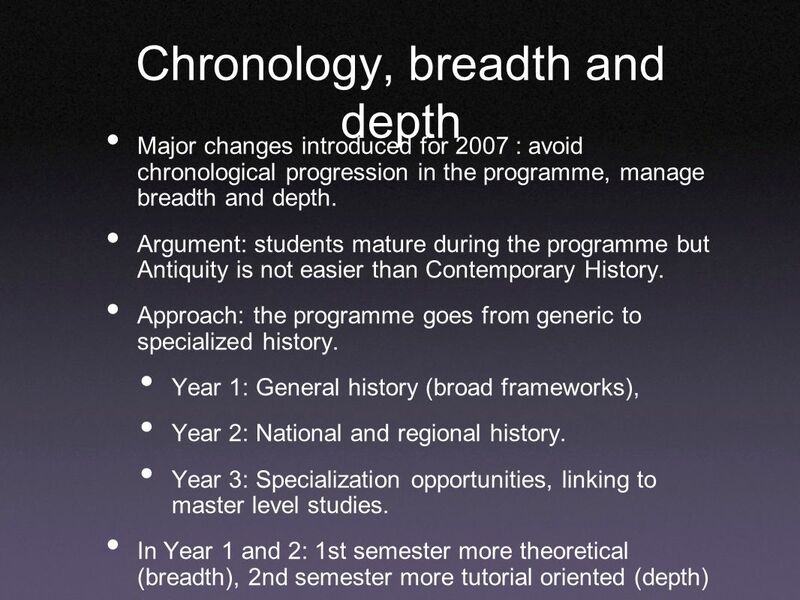 Not mapped to courses but related to teaching methodologies and learning environment. Not easy to quantify in terms of workload. Adoption of concept implies pedagogical introspection and has impact in everyday practice. Not related to scientific knowledge, but rather to less stable concepts of social effectiveness. QA harder without intrusiveness. 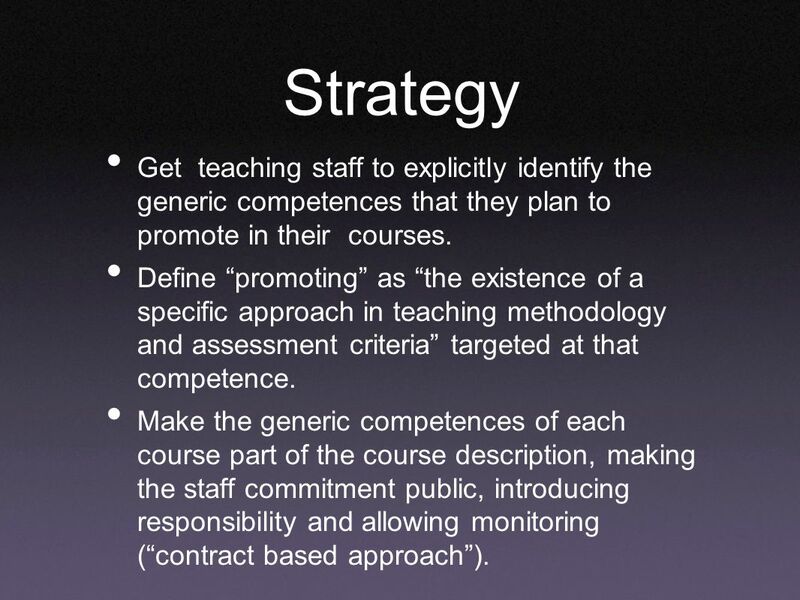 14 Strategy Get teaching staff to explicitly identify the generic competences that they plan to promote in their courses. Define promoting as the existence of a specific approach in teaching methodology and assessment criteria targeted at that competence. 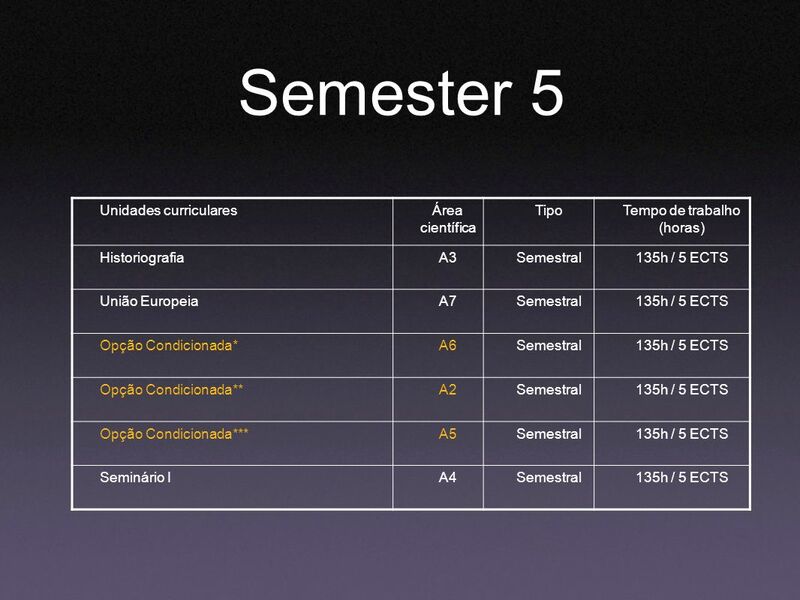 Make the generic competences of each course part of the course description, making the staff commitment public, introducing responsibility and allowing monitoring (contract based approach). 15 In practice 1. Capacity for analysis and synthesis 2. Capacity to deal with complex and contradictory information 3. Quality in oral and written expression 4. Knowledge of information handling techniques 5. Planning and project management 6. Initiative 7. Group work Fragment of a course description on the web. 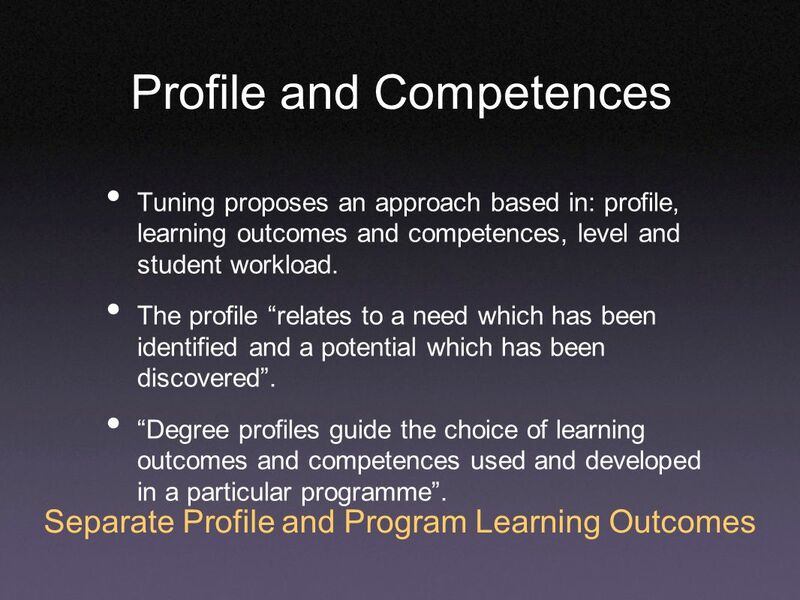 Subject specific are pre-determined for a given course but generic competences depend on the professors decision / learning environment. 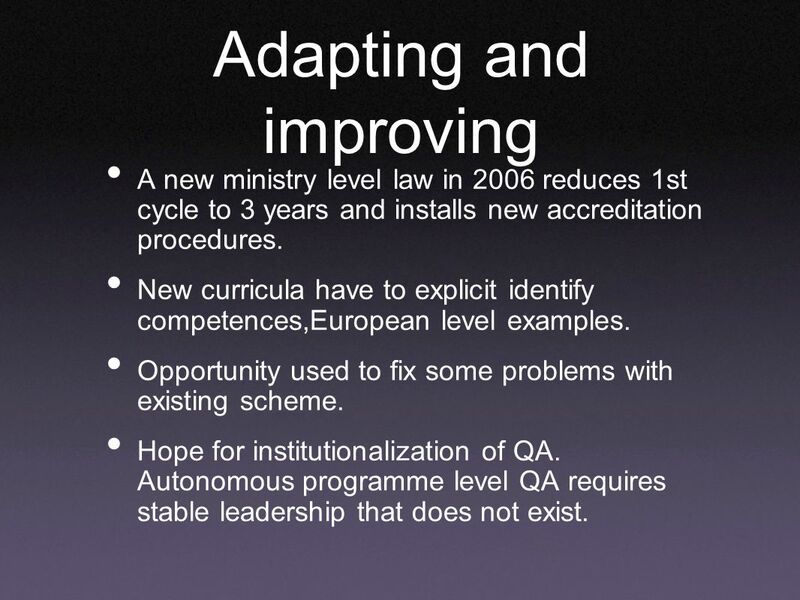 16 Adapting and improving A new ministry level law in 2006 reduces 1st cycle to 3 years and installs new accreditation procedures. New curricula have to explicit identify competences,European level examples. Opportunity used to fix some problems with existing scheme. Hope for institutionalization of QA. Autonomous programme level QA requires stable leadership that does not exist. 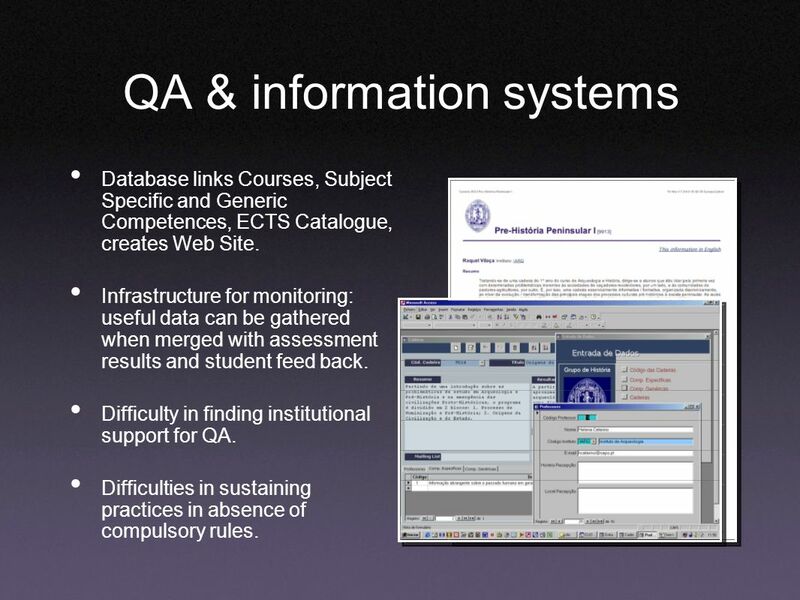 26 QA & information systems Database links Courses, Subject Specific and Generic Competences, ECTS Catalogue, creates Web Site. Infrastructure for monitoring: useful data can be gathered when merged with assessment results and student feed back. Difficulty in finding institutional support for QA. Difficulties in sustaining practices in absence of compulsory rules. 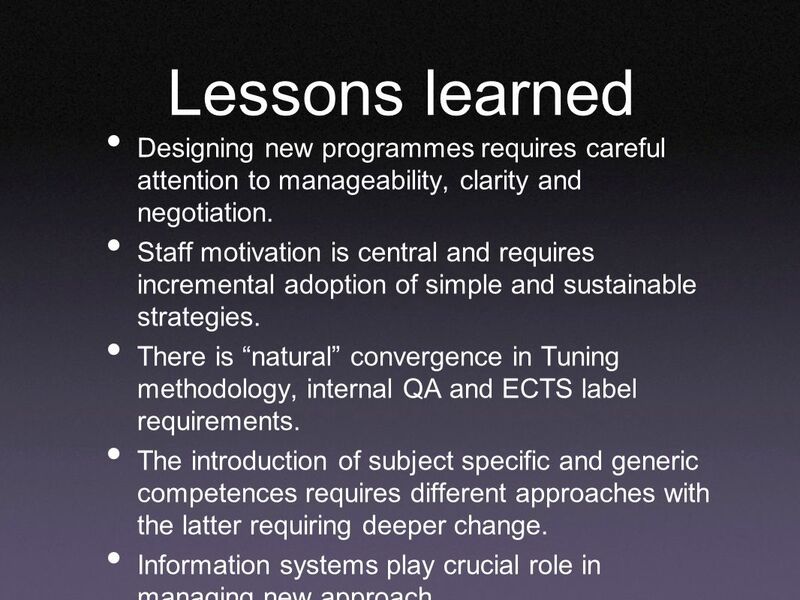 27 Lessons learned Designing new programmes requires careful attention to manageability, clarity and negotiation. Staff motivation is central and requires incremental adoption of simple and sustainable strategies. There is natural convergence in Tuning methodology, internal QA and ECTS label requirements. 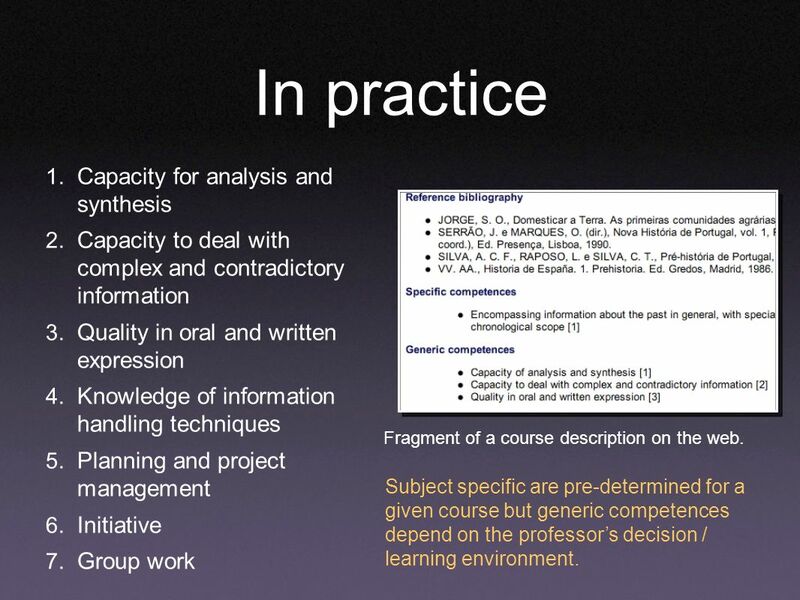 The introduction of subject specific and generic competences requires different approaches with the latter requiring deeper change. Information systems play crucial role in managing new approach. 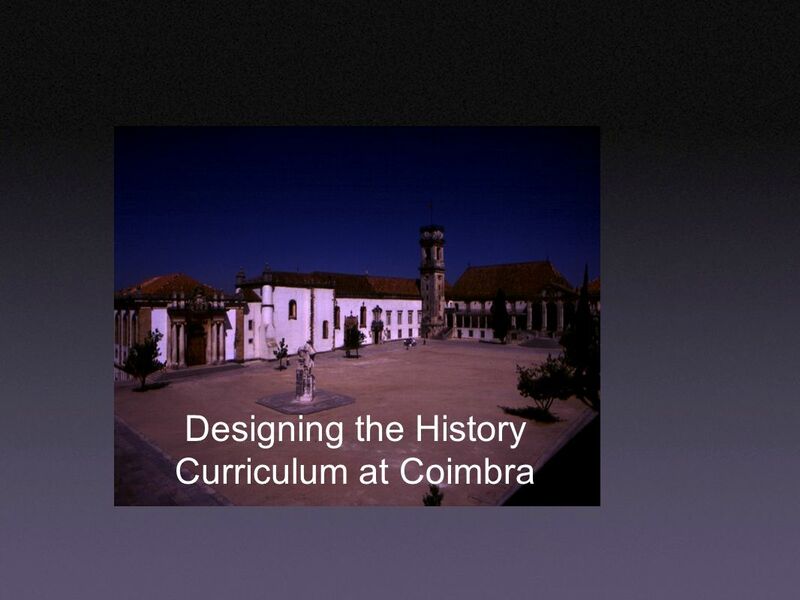 Carregar ppt "Designing the History Curriculum at Coimbra. Summary From principles to strategies: how to get it started and making it work. Incorporating the Tuning."